Welp, last night was the Iowa Caucuses. Or, as we say in our household, “Involuntary Nap Night.” Honest to God – we had at least 10 browsers open full of different polling data, plus NPR on the radio. We were on it. Tracking. …Until I fell asleep in the leather chair. And by 11pm I couldn’t hit the refresh button any more so I went to sleep. But today is a new day, Tune-Up Nation, and I for one want to see another kind of battle than the one between Clinton and Cruz, or Clinton and Sanders, or Trump and the collective knowledge of mankind. So behold the glory of Count Basie and Oscar Peterson doubling up on that old swing classic, “Jumpin’ At The Woodside.” They’ve got my vote. Welp, we’re on Day Three of “Job? What Job?” here in our nation’s capital. The federal government is closed, the Senate punted votes, the House isn’t voting on anything, and we’re all still trapped inside. Those of us who can get out rapidly discover there’s…really not all that much point, except going to a bar that’s open simply because it’s open. Yes, it’s a little oppressive. And now, perhaps, we can all understand why more babies are born in late summer and autumn than any other time of the year. Well, yeah, but if Burberry named their door mats “Boston,” “New York,” and “Philadelphia,” it might be a little annoying. (Then again, Americans are narcissistic enough to think of it as a compliment, so IDK.) Klaus Kjoller, of the University of Copenhagen, discovered that Ikea had named foot-wiping items after Danish towns, concluding this was an insult because, rationally, “Doormats and runners, as well as inexpensive wall-to-wall carpeting, are third-class, if not seventh-class, items when it comes to home furnishings.” Burn! Charlotte Lindgren, an Ikea spokesperson, responded by explaining that, even if this HAD been a thing Ikea had done intentionally, which it totally wasn’t so stop alleging it was, it’s a compliment! “These critics appear to greatly underestimate the importance of floor coverings. They are fundamental elements of furnishing. We draw worldwide attention to Danish place names with our products. That has to be a positive thing.” Snap! So, today, give thanks for Sten – for fighting for Sweden’s independence, and for insuring that one of the world’s largest, most confusing meatball-and-furniture companies can foment mild diplomatic spats with their rugs. Skål! Today in 1809, the 10th Congress (one of about seven that haven’t totally sucked) created the Territory of Illinois. That being awesome, and Chicago being awesome, I give you the Blues Brothers. – Pericles, funeral oration, 431 B.C. I marked my 23rd birthday while monitoring the second round of presidential elections in Boghe, Mauritania. I remember so many things about that day. I remember the delay on the satellite phone I used to call my parents during a lunch break. I remember the uneven wooden benches we sat on as we watched hundreds of people file into concrete block schoolhouses, present their I.D. cards, be handed a ballot, go behind a cloth screen, make their choice, stuff their ballot in a plastic bin, dip their finger into an ink bottle, and walk out. Person, after person, after person; men, women, and new-to-voting teenagers. I remember watching an argument between an election official and a woman who had walked twenty miles to vote but had forgotten her identification. I remember watching the vote count, late into the night. I remember being amazed at how fervently people wanted to vote. I remember wishing my country was similar. I remember Mauritanians asking me why it wasn’t. Voting is the only thing about which I am an absolute evangelical. It is America’s strongest and most enduring characteristic and the thing that, despite everything, still compels foreigners to emigrate. It is undeniably the most patriotic act an American citizen can perform. 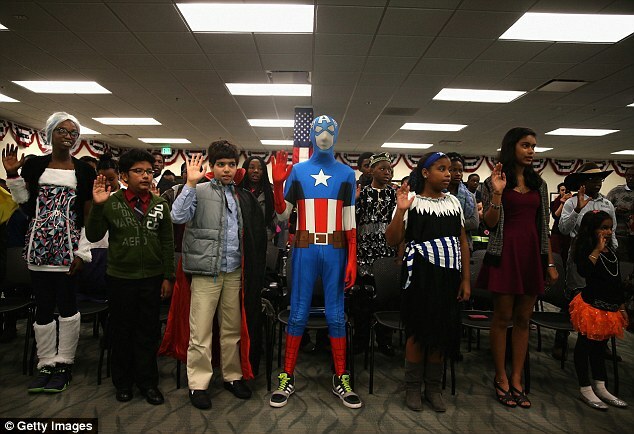 It is why 13-year-old Erza Retta Dessie from Ethiopia wore a Captain America costume when he got sworn in as an American citizen four days ago. The greatest gift I got while I was an international election monitor was understanding the power of the ballot box. You can’t change anything without participation. Tired of corruption? Vote. Think politicians can’t be trusted? Vote. Want your guy or woman to win? Vote? Want any kind of change? Vote. Want to affirm the reasons why your forefathers came to this country? Vote. Want to affirm the assertion that people can change a nation? Vote. To motivate you, and in honor of the late departed Mr. Bradlee, a titan of the field of journalism, I give you the Washington Post March.